"Aura Glasses: An affordable aura viewing tool that works!" Aura Glasses: You Can See Auras! A few years ago I purchased a pair of aura goggles and had success in increasing my aura viewing abilities. Then I discovered an indigo filter that, when held to the eye, allowed me to see auras just as the aura goggles did. I knew I could create a product that was less expensive for the consumer, but I also wanted to include a book that would help others experience success in viewing the subtle energies in our midst, not normally sensed by us. The Aura Glasses and accompanying book do just that! "Aura Glasses You Can see Auras" sold over 2,000 copies in the first year of printing and can now be found around the world. 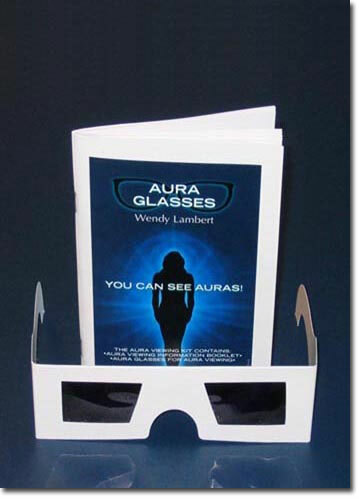 Please check out the "Aura Book" section to see if you would like to purchase a copy of the book, which includes a pair of aura glasses. Notice: Although the shape of the "Aura Glasses" is quite similar to "3D-glasses", the filters used in the Aura Glasses are completely different! Copyright © 1996 - 2007 Earthtopia. All rights reserved.